Epic Eric ticks all the mobile game design boxes: simple controls, bite-sized gameplay, basic puzzle elements, collectables and simplistic art all feature, the only thing missing is micro-transactions and no one is mourning those! With all the predicable it is quite refreshing to see that Epic Eric does have a few interesting ideas. It’s a puzzle platformer where you must guide Eric to the top of the tower at the opposite side of the screen. You do this by tapping on the screen to make Eric jump onto two types of cog; one that spins constantly and will spin Eric with it and another that requires momentum from Eric’s landing. To reach the tower you must tap at the right moment so Eric will fly onto the next cog. 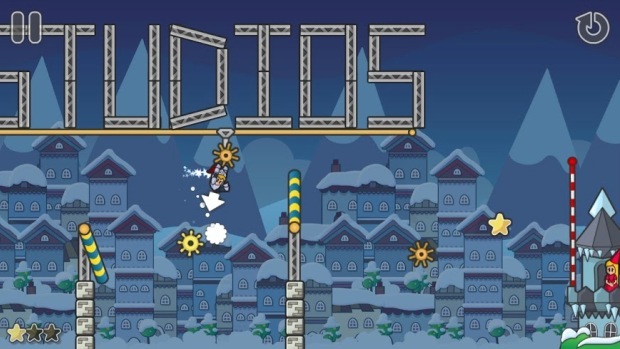 Missing the cog and hitting the floor will result in having to restart the level. It sounds complex, but in reality is incredibly simple. It takes a while to get the timing right, especially when jumping on or off the momentum-controlled cogs. At times it feels like the physics are slightly off, when jumping at what looks like the perfect time is often rewarded with a straight drop to the ground. This can be hugely frustrating when you mess up the final jump in what feels like an unfair way. 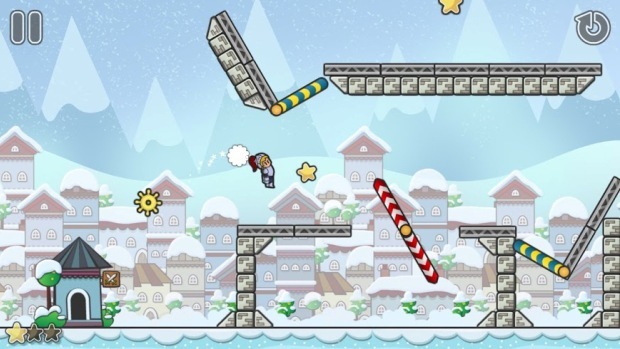 Later levels introduce other mechanics such as bounce pads, pinball-style flippers and platforms to roll across. 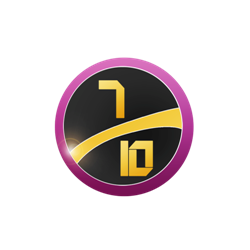 They all offer a small change of pace and when combined together in the bigger levels they create some brilliantly challenging puzzles. These more complex levels probably make up around half of the 45 on offer, while the other half are generally quite easy and require little thought. Throughout each level are three stars. You don’t have to get them all to complete the level but aiming for them makes things a lot more interesting. You can ignore all the stars if you lole, but then the game is far too easy. After the first few introductory levels, stars start appear in hard to reach areas that are away from the simplest route to the tower, meaning you have to risk failing the level to get those extra stars. Overall, the 45 levels shouldn’t take too long to finish but getting all the stars may take a while. At first it appears that Epic Eric plays up to the “male knight saving the female princess” fairlytale story but you can flip this on its head by playing as the princess, called Erica, who has to save the knight. The change makes no difference to the gameplay (it just swaps the sprites of the two characters), but it’s still a great option to have. The basic graphics work quite well, with each of the three different areas offering some small visual variations. 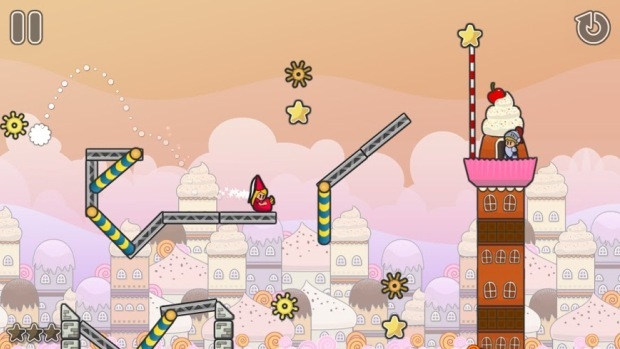 The Cup Cake Castle stages are by far the most pleasing; add in the simple yet quite cute character animations and the comedy of seeing Eric face plant the floor and you have a very entertaining visual style. VERDICT: Epic Eric is the perfect game to play on the tube. It will keep you entertained, but doesn’t require massive amounts of concentration. The gameplay is fun and some of the puzzles are brilliantly designed. However, too many stages are too simple and offer little challenge. All in all, Epic Eric is a decent game, but somehow feels like it’s missing a final stage.